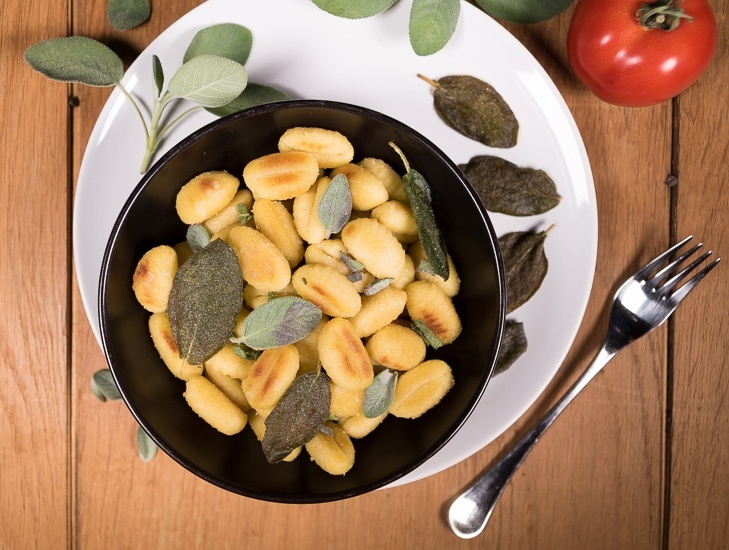 Gnocchi and sage have always been a match made in heaven. 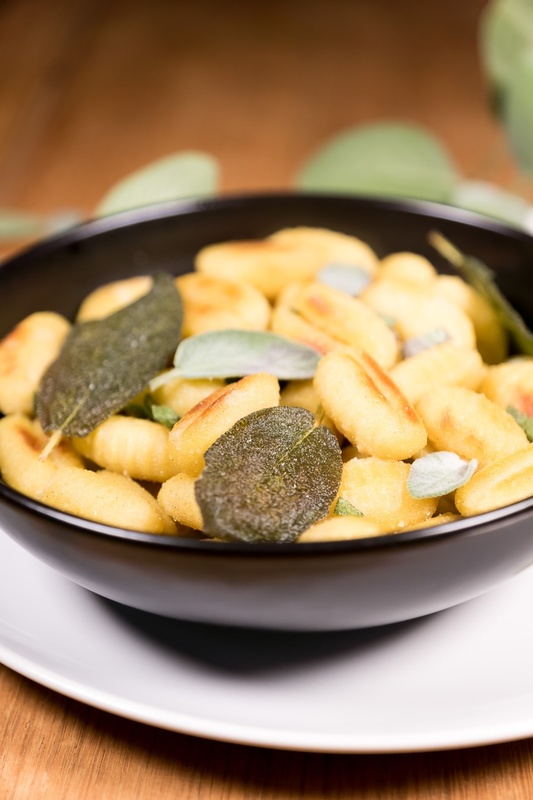 Italians have known it for a long time and used these simple ingredients to make their tasty traditional quick meal Gnocchi Burro Salvia (gnocchi with sage butter). It’s perfectly ok to use olive oil instead of butter, but this is not the only change I made to the classic recipe. I like serving gnocchi with both fresh sage and crispy fried sage leaves to get the most out of this delicious and spectacularly scenting and tasting herb. If you haven’t eaten crispy sage leaves sprinkled with a bit of salt yet, you’ve missed out on a delicacy. This yummy treat is fast and easy to make by frying sage leaves in hot oil for a couple of minutes. It’s a perfect little snack on its own, and superb with gnocchi. Gnocchi make me happy, not only because they are funny little bite-sized pieces so easy to eat, but also because they taste gorgeous and are versatile (you can pair them not only with sage, but also with a tomato sauce, a green pesto, or just eat them with olive oil and a sprinkle of salt). An additional benefit is that they are fast and easy to prepare. You either boil them in salt water or fry them in a bit of oil for a couple of minutes. The cooking instructions on the package will tell you if the gnocchi need cooking in water or frying in oil. If you’re going to use cooked gnocchi for this recipe, you’ll get a lighter and creamier dish, so go for them if this is what you’re craving. On the other hand, fried gnocchi are crispier and have more crunch. Either way, at the end you’ll have a hearty comfort food that will entice you to overindulge. You can serve the gnocchi with salad, but I prefer them either on their own or just with some slices of tomatoes or cucumber. Strip the sage leaves off their stems. Give the leaves a good rinse under running water to clean them. Choose the 15 largest leaves for frying and set the other leaves aside. Pat the large leaves dry. My preferred method is to place them on a kitchen towel, cover them with a second kitchen towel and gently press to squeeze out the excess water. The leaves should be dry when frying in hot oil otherwise there is going to be a lot of sizzling. Heat 5 tablespoons of standard olive oil in a large pan. Place the dried large sage leaves in the pan next to each other (they shouldn’t overlap), and fry them for 1-2 minutes on each side until they start to get crispy. You should pay close attention as the leaves tend to burn quickly once they are done, turning brown and losing their earthy sage aroma, tasting burnt. You know the leaves are done when they start turning crispy and are still green. Remove the leaves from the pan, place them on a paper towel and sprinkle with a little salt. Cook or fry the gnocchi according to the package instructions. Chop the fresh sage leaves finely and mix them with the gnocchi. Mix in 1 tablespoon of extra virgin olive oil, 2 tablespoons of nutritional yeast, and season with salt and pepper to your taste. 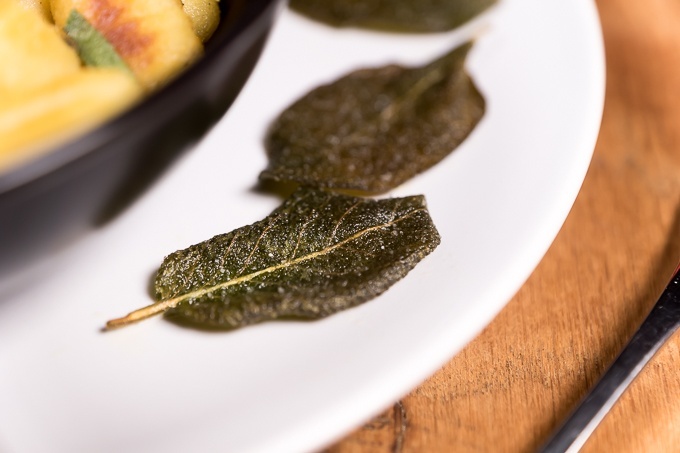 Serve the dish topped with crispy sage leaves. 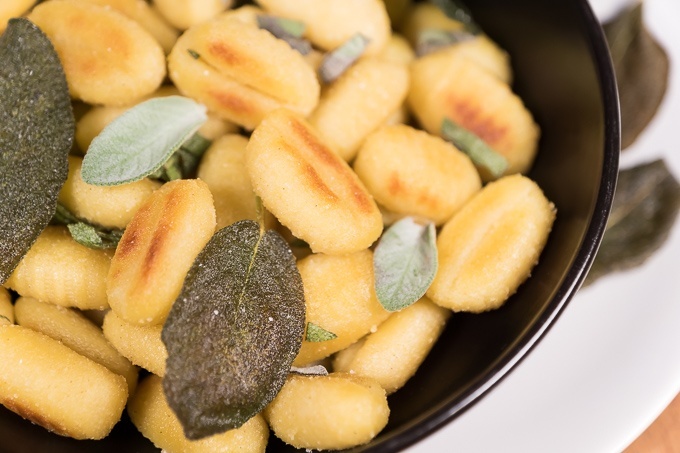 Oh, so tasty, I think I have to eat some gnocchi with crispy sage this evening… thanks for the idea! Thanks for your comment, happy you like the recipe. I hope you’ll like the dish as much as I do. You’re recipe sounds truly delicious and ingenious – I never thought of combining gnocchi with brussel sprouts. Nom, thanks goodness I’m not hungry right now as I had a late lunch. 🙂 Nom! Will give it a try at the weekend.